Around the time I started the book, the group of volunteers behind Mapstraction started working on a new, improved version of the open source wrapper library. 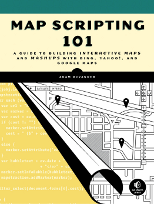 This is the mapping API I recommend because it allows developers to write code once that works on any mapping provider. Also, I use Mapstraction throughout the book, so I want to see it be successful. So, for the first time, I contributed code to an open source project. 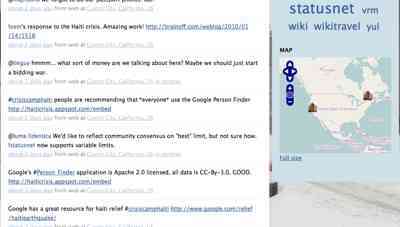 This new version of Mapstraction is now showing up in production on sites around the web. For example, Nestoria, a real estate search engine based in the UK. Nestoria has long used Mapstraction and helped fund its initial development, so it’s not a big surprise to see if leading the way with the switch to the new version. What is exciting is that Nestoria was able to decrease a user’s download by 100K by switching to the smarter V2 of Mapstraction. 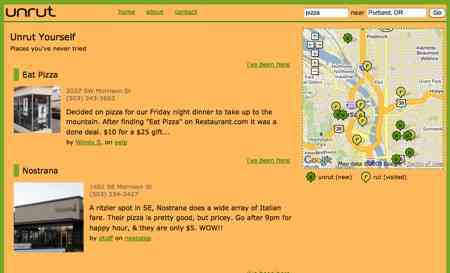 At the same time, Nestoria also switched mapping providers to the third version of Google Maps. I’m proud to say that Nestoria contracted me to help support this provider in Mapstraction. My thanks go to Ed Freyfogle for the opportunity. 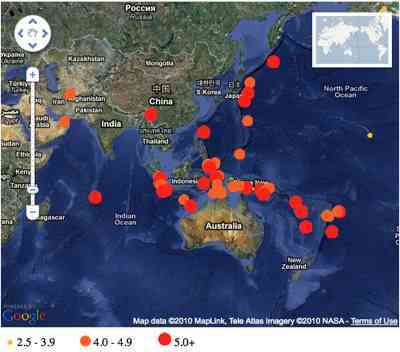 Open microblogging platform Identica recently implemented maps on its service. 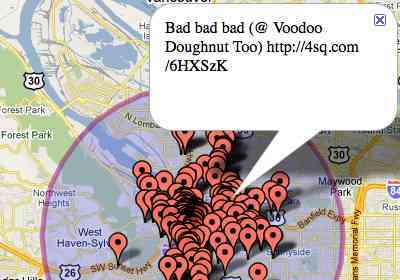 Any status message that has been geocoded will be displayed on a map. And like Nestoria, it chose Mapstraction V2, another good sign. Want an introduction to Mapstraction? My Start Here Guide has been updated to use the latest version, or check out the API sandbox. Today I launched a new site to show what is possible with the NextStop API. My site is called unrut and it helps you find new places where you haven’t been before–it helps you get out of a rut! Enter your location and a search term. Through the magic of Ajax, the results are loaded and plotted on a map. There is a thumbnail photo for every result, plus a recent recommendation from a NextStop user. The really fun part comes once you’ve marked the places you’ve already been. You’re left with a list of new places to try! Now this should make you feel good about mobile web standards. Mapping pioneer MapQuest is now using the geolocation standard to provide directions from your current location in MapQuest Mobile — m.mapquest.com, which does not work in a non-mobile browser. When you select a text field, MapQuest provides an option to use your current location. Then, when you submit the form, the browser requests your location. It’s great to see more of this “in the wild,” especially from a major player like MapQuest. 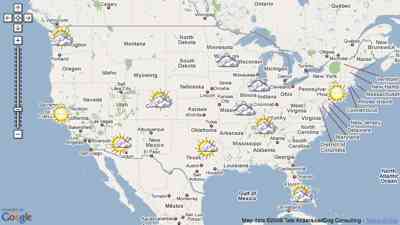 Some giant chunks of data are making their way to web maps and they’re looking slick. When you have millions of records, you can’t simply add a marker for each one. Instead, you aggregate, as these two mashups have done. 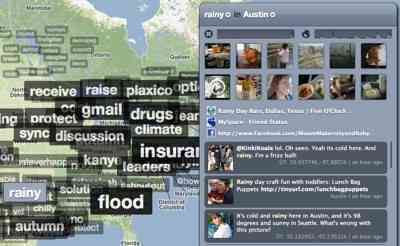 Trendsmap uses the most popular terms being discussed on Twitter. But the fun part is that, rather than looking at all trending topics, it segments them into location and puts them on a map. So, whatever is big in Portland might be different from Atlanta or London. Once geolocated tweets are commonplace (it’s coming soon), we’ll see even more of these sorts of apps. Knowing what’s going on in a country, city, or within a quarter mile will be a click away. How might that change how we interact? Recovery.gov is tracking billions of dollars in U.S. stimulus money as it flows out of Washington. 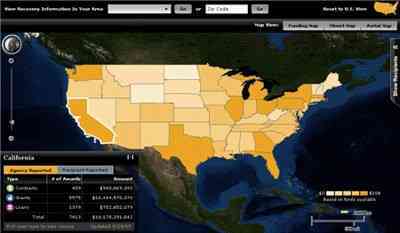 A nice piece of website real estate is devoted to a map application for slicing and dicing the data. You can see the funding by state, department, agency and awards type. This sort of accountability it going to become expected at every level of government. You had better believe we’ll need web mappers to help achieve transparency.